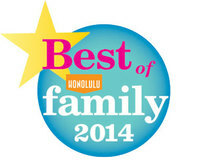 Honolulu Magazine's Winner 2014, 2015, 2016, and 2018! "BEST After School / Enrichment Program!" Lessons, Songs & Interactive games! Perfect way to reinforce classes!